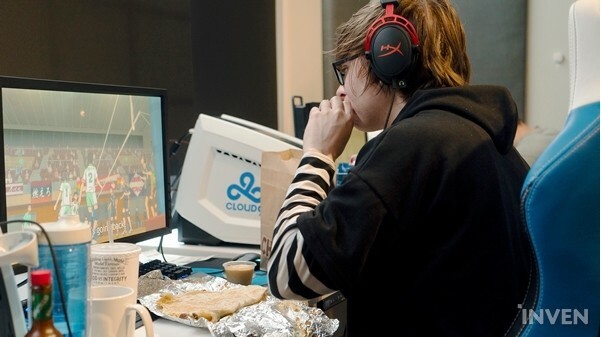 Cloud9: A Day In The Life Of A Professional Player. Have you ever wondered why ‘Keeping up with the Kardashians’ is so famous? Although the family itself is very entertaining to watch, people love the show because it gives them a different point of view. Instead of following your favorite celebrity through articles and tweets, you get to sit down on your couch and watch how they live from day to day. There are similarities to what I have just said to professional gamers. 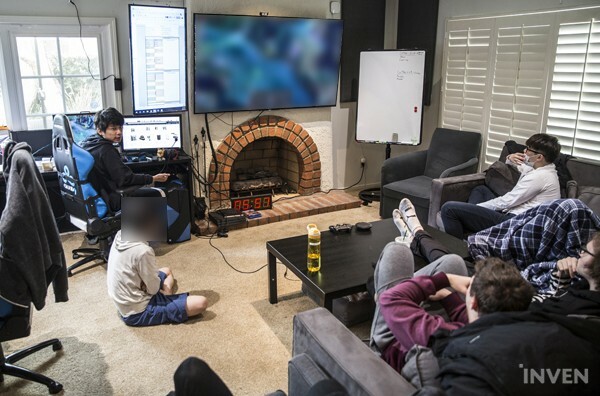 Part of the reason why “So and so Gaming House Tour!” videos on youtube are so popular is because it gives the fans a viewpoint of professional gamers’ day to day lives. 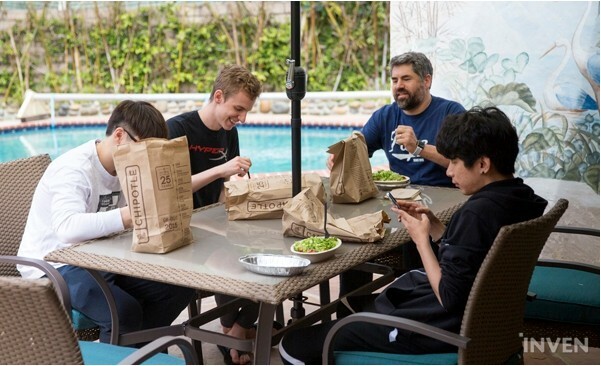 Most, if not all, League fans have wondered what their favorite team or player does when not performing on stage. How do they prepare for games? How are their lives different? What are they like when not on stage? 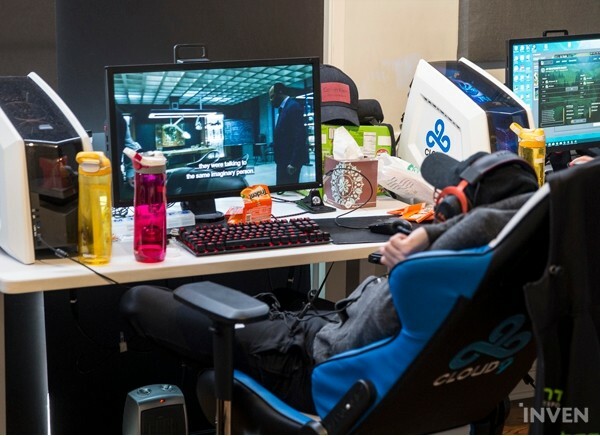 To answer these questions, Inven Global decided to go further than the norm and spend a day with one of NA’s representatives teams, Cloud9. 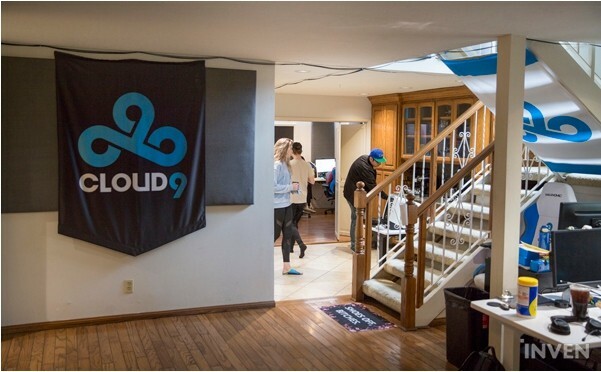 Cloud9’s gaming house is a normal 2 story house transformed into a training center. 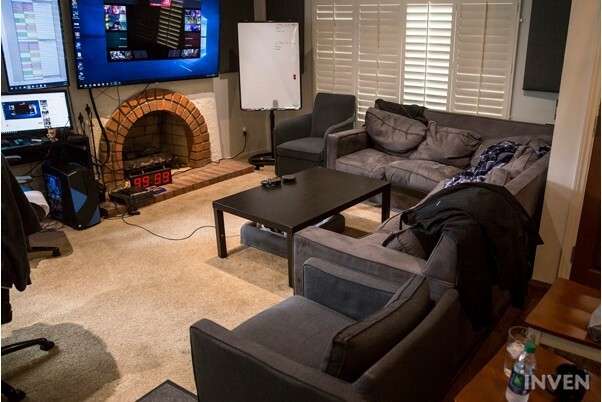 This type of gaming house is the go to format for a majority of Pro Game Organizations. 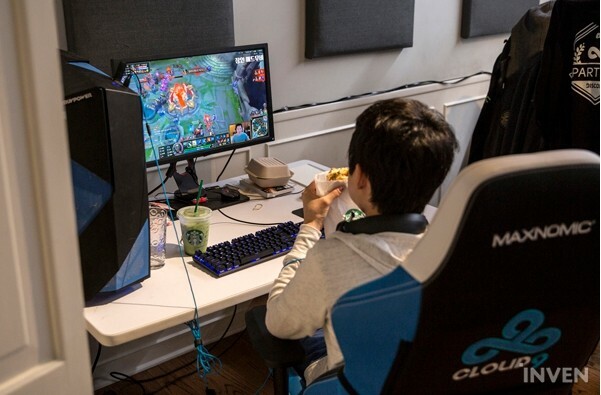 When organizations do decide to remodel homes into gaming houses, the advantages are that there is little locational and monetary restrictions. In some cases, organizations separate the living quarters to that of the training area. When dividing the work place and where you rest, they say it creates an environment where the players can concentrate more. Waking up, the players shower and come downstairs to grab something to eat. 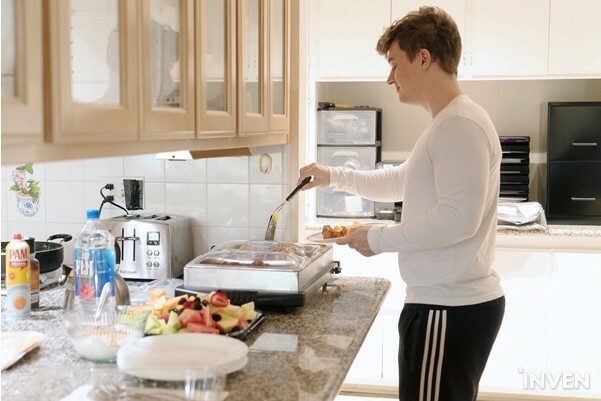 Breakfast is cooked by a chef provided by Cloud9. The chef prepares food that is not intimidating to the recently woken player’s stomachs. Although a breakfast menu is provided, the players are not forced to eat it. 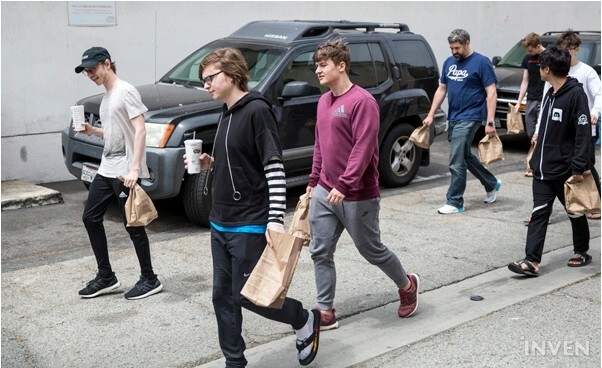 In some cases, players would deliver or go out and buy food they prefer to eat. The players then go to wherever they are comfortable to eat breakfast. 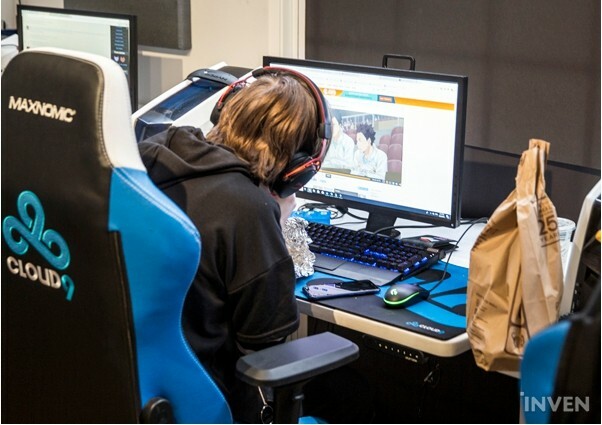 There are players that prefer the comfortable couches or just sit in front of their computer while watching their favorite tv show. 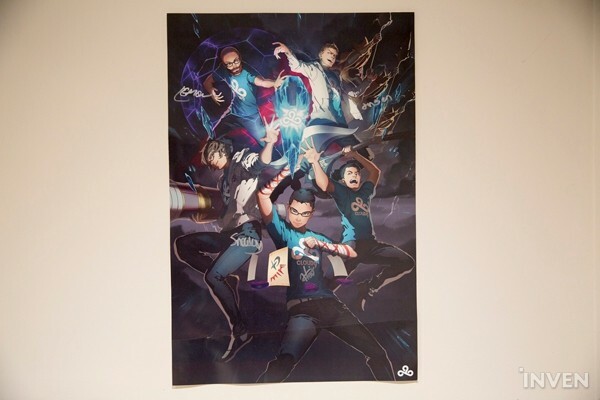 Most of the time, Pro Game Organizations have set rules on lifestyle in the gaming house. However, C9 seems to really enforce freedom as much as they can. 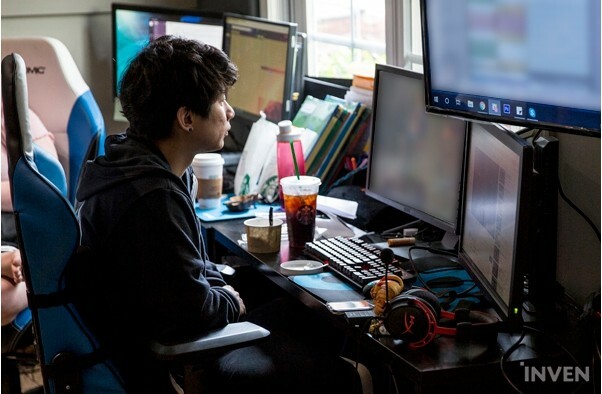 In some Asian Game Organizations, they do not allow food to be eaten in front of the computer and enforce that breakfast must be eaten. Due to the upcoming scrim schedule, the players slowly make their way to their respective seats. The seats are arranged much like the NA LCS stage is. 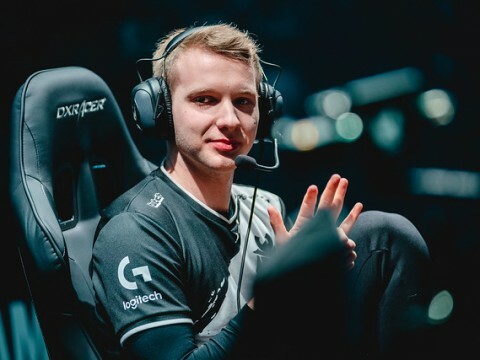 Ordered as Top, Jungle, Mid, AD Carry, and Support. 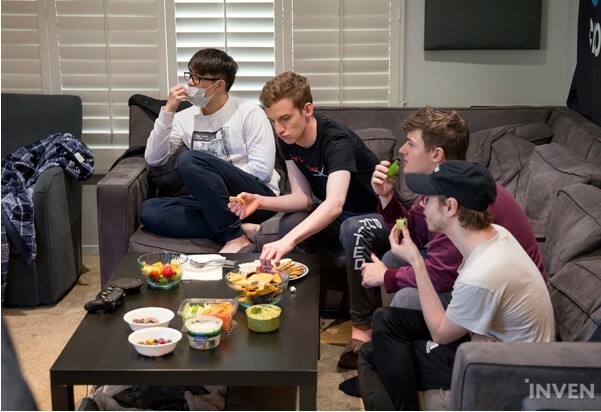 Whilst waiting for the scrim to begin, the players sit in their comfortable positions. They watch their favorite tv show, youtube clips, and stream VODS to pass the time. Once both teams and coaches are in their respective positions, the scrim matches begin. Afterwards much like what all of us are familiar with in broadcasts, the players enter champ select. 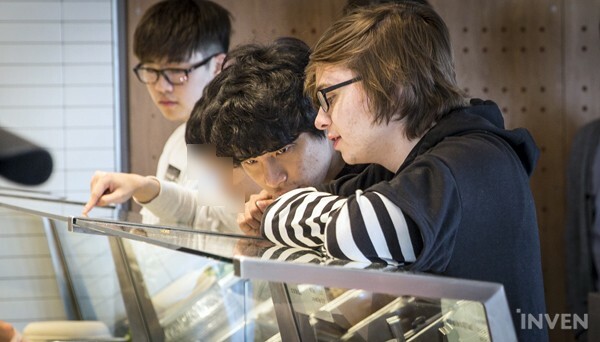 The players and coach start to discuss picks and bans with each other. Only this time, we heard conversations that you can normally never hear. The players did not seem nervous compared to when they are on stage. They would exchange banter/jokes to each other and laugh. Sincere conversations would be added in here and there. The players would be extremely confident when they get the picks that they want. Saying things like “We got ***** and *****, GG we won.”. 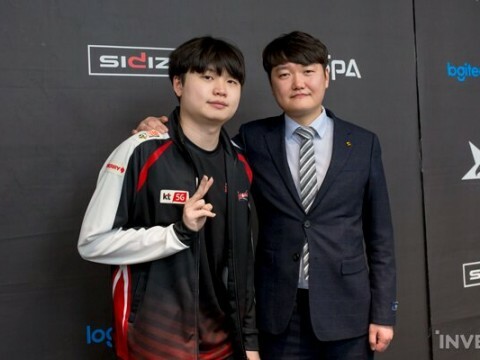 On the other hand, Reapered would give his opinions and advice to players who are unsure about certain matchups or champion picks. 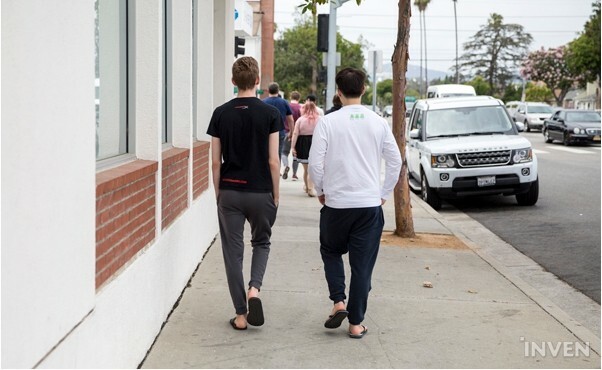 When the picks/bans are over, much like a real live game, the coaches step out of the practice room. At this point, the scrim match has officially started. Just like the waiting room in the NA LCS, Reapered makes his way to the living room. 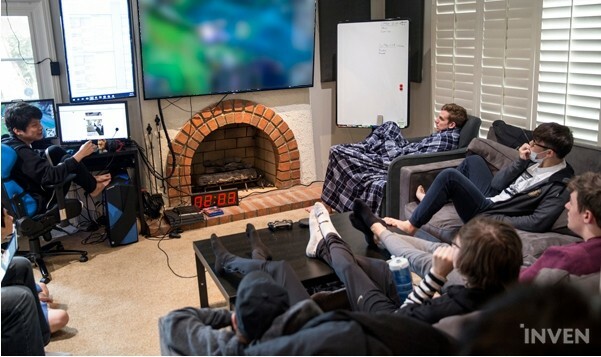 The living room has a big TV to display the scrim with no delay. Even the player’s voice chat is transferred onto the living room speakers for the coach to listen. 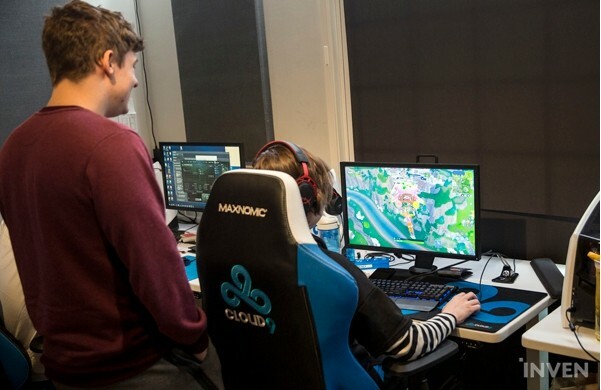 Through listening into the voice chat, the coach is then able to analyze how the players shot call, who shot calls the most actively, and who follows or does not follow the calls precisely. While looking at the game, the coaches share their thoughts and opinions. In addition, the coaches save timestamps at moments where the team can improve. This creates easy pinpoints for giving feedback and also help create future feedbacks. The first game didn’t go off easily. There were clear mistakes from the players. As the mistakes appeared, Reapered’s eyes became equally as busy. The results of the first scrim: Cloud9 won. However, the player’s faces were not as bright while moving to the living room for feedback. The feedback regarding the game had begun. While asking how the game was to the players, Reapered rewinds to the start of the recorded game. Without filter, Reapered showed moments when they did well and when they did poorly. Reapered would flame the players to easily reason with them and praise them as well. It was not long till the discussion regarding macro began. The topic of discussion was whether or not it was correct to use Teleport at a certain point in the game. First, Licorice gave his thoughts and opinions on the matter. Afterwards, the rest of the players would then add their own opinions. Some would agree with each other and some would disagree. When the opinions are more or less agreed upon, they move onto the next topic. The next topic regarded to teamfight positioning. It was a review on the reasons why C9 had lost one of the teamfights. Each of the champion’s positions became feedback. Asking a variety of questions, Reapered discussed with his team: did they really need to fight, was the teamfight timing correct, was there any mistakes regarding the teamfight, etc. While observing the feedback, something caught my eye. Ticking ever since the start of feedback, the timer had all of a sudden passed 20 minutes. When asked what the timer was necessarily for, Reapered had said that they installed it because they wanted to see how long feedbacks would take. Because there are time restraints when giving feedback in live games, Reapered needs a timer installed to adjust feedback time durations. The second scrim has started. As the players go into champ select yet again, the coach and the team exchange opinions. 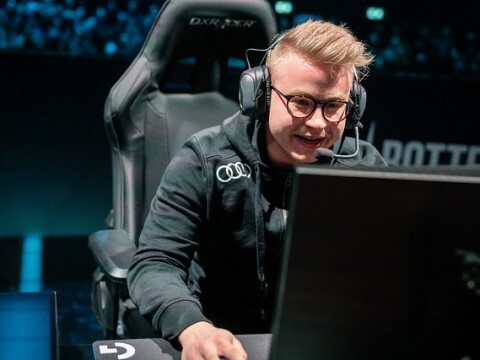 However this time, a player actively asked his coach if he can pick a champion that he wants to play. Reapered gave his honest opinion. 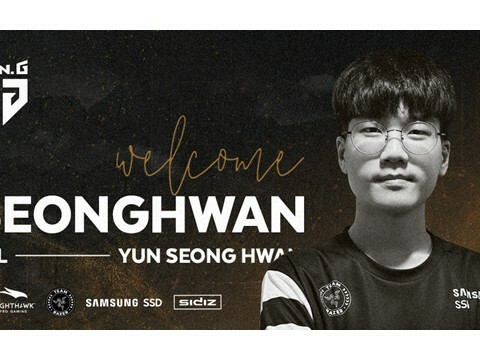 He explained whether or not that champion would be a good/bad pick against the enemy mid laner, how his pick will synergize with the team’s composition, etc. Despite all this, Reapered agreed to the idea. The performance of this champion will be then reviewed by the coaches and discussed at the next feedback interval without filter. While exchanging jokes on both sides of the in-game chat, the second scrim began. The feedback of the second scrim is currently in session. However this time, I began to see the small characteristics of some of the players. There were players that would actively voice out their opinions while others would quietly listen. There was also a player that passively admitted his own mistakes. This time, a new topic came into discussion that was not talked about in the first feedback session. It was side lane management. The most important issue of who should go to manage the side lanes. Due to the restrictive 1v1 matchups in the side lane, it all comes down to champion item growth, champion scaling, and summoner spell cooldowns. Because side lane management is so closely related to the overall operation of the team, the feedback was given over a long period of time compared to that of other factors. The second feedback session ended with praise to the team. Just like the first feedback session, time was equally spent on the second. The players, coaches, and staff all set out for lunch. Normally, the chef would prepare food for the entire group. 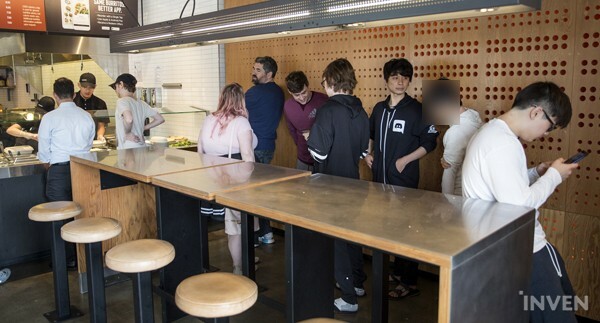 However due to implications that day, Cloud9 had to venture out for lunch. The players went out to a local restaurant to grab their lunch. Compared to the other 2 previous scrims, the third scrim ended relatively fast. This time, the feedback consisted of how to counterattack the opponent when in a favorable situation. In essence, which lane to attack? 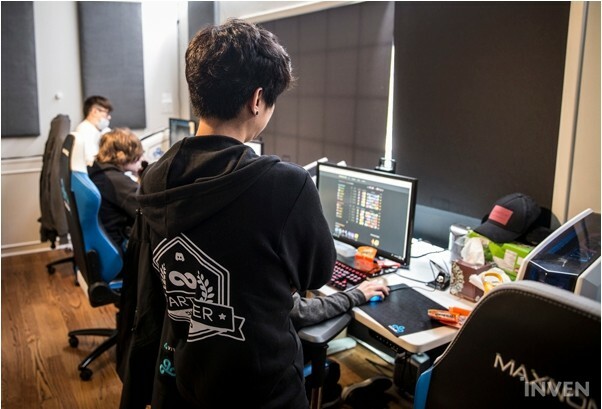 Reapered gave feedback on what objectives to take and what preparations are needed in order to achieve this. Due to this scrim being the cleanest out of all the past games, there was not that much discussion. 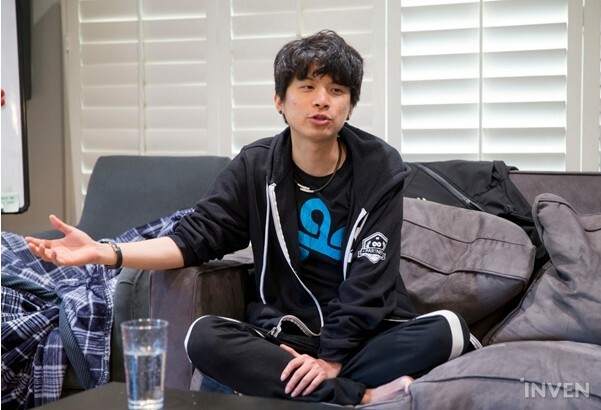 With some free time available, we got the opportunity to conduct a very short interview with C9 Reapered. During the interview, I was able to listen to some of his ideas and philosophies regarding feedback. ¤ When scrims start, how do you go about giving feedback? Normally how I give feedback depends on which part of the season it is. Because the players are just coming back from their vacations, I am approaching it as if it was the first time. I am trying to fix the in and outs one by one. Due to NA having the longest break time compared to other regions, the solo queue habits tend to resurface again. Now, I am fully focusing on adjusting and removing those tendencies. ¤ Is there a difference on how and what you give feedback in scrims compared to live games? There is a huge difference. During scrims, I can give in-depth feedback while watching the game replay. However with live games, there is limited time and no replay. I need to decide on what points that need to be focused on for next game’s win. I would only pick on fatal mistakes that they should not be making and focus my feedback mainly in those areas. ¤ You use a timer when you give feedback. 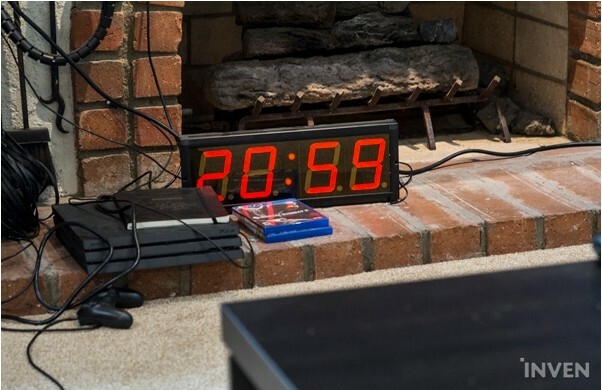 What is that timer necessarily for? It is a tool to see how much time we spend on feedback. Due to the time restriction in live games, I try my best to match the feedback time we have in scrims to that of live games. ¤ When giving feedback, which player is the most outspoken? On the other hand, which players tend to listen more? Our bot lane is by far the most outspoken. Other players tend to express their opinions only when they feel the need to speak. ¤ In regards to feedback, what do you mostly focus on? Carrying out feedback in a short, concise, and non-resultant manner. If my feedback becomes too long or slow, it becomes harder for the players to absorb the information. In reality even if I talk about several things, the players will only understand and carry on 1-2 things. Because of this, I try to focus on 1-2 main things that they can take away from. The reason why I try to make feedback non-resultant is because it is easier for a player to absorb the information. Instead of saying ‘Because the result is this, you need to do this’, I would say ‘Why do you think this occured?’. It is extremely important to ask this in order for the players to fully understand the situation. The scrims and feedbacks continued. After finishing lunch, the players were steadfast in practice without a sign of boredom or fatigue. 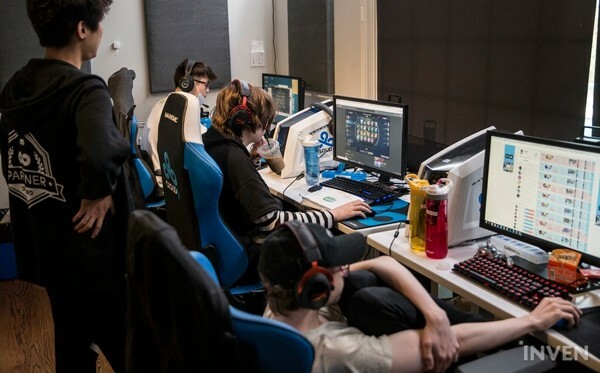 From 11:00 AM to 5:30 PM, the players go through a total of 6 and a half hours of both scrims and feedback sessions. After all 5 scheduled scrims are over, the feedback sessions were also completed. Due to the early end of scrims on this particular day, the coaches gathered the players to ask if they want to scrim more. Every player gets a valid vote. Ultimately, C9 decided to not play another scrim game. For a short time, the players had the luxury for a bit of break. The players group up once more. 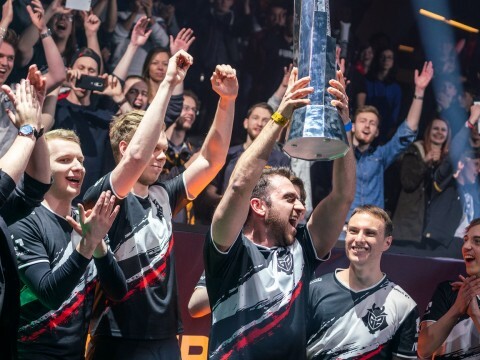 Now, it is time to review the matches from this year’s MSI. The game that was reviewed was Fnatic vs RNG in the semi finals. Shortly after the picks/bans, Reapered asked the players what they thought of each team’s composition/bans. One by one, the players began discussing amongst themselves on the reasoning behind each pick. How each team comp should play and also predict the general flow of the game. From the start, Fnatic had great momentum. However from the misexecution of the 3 man dive top, the overall flow of the game had suddenly shifted. C9 quickly stated what the players in the game were doing well or wrong. 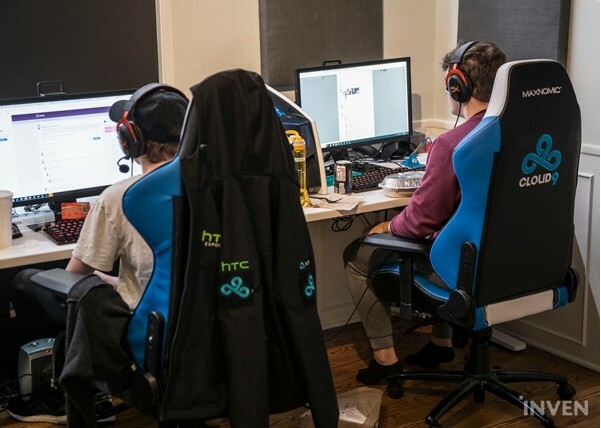 Cloud9 had full attention on how the Fnatic and RNG progressed the game. Shortly after closing the VOD, Reapered explained his reasons on why he chose that specific game to review on. He began to clarify that unlike other games, this game had Aurelion Sol. Aurelion Sol brings a new dynamic into the game, and Reapered wanted to show C9 how and why it changed. Also, Reapered wanted to show this specific clip because Fnatic did not know how to use their advantage (Aurelion Sol) properly. The official schedule is over. The players now have full freedom to do whatever they choose. The players would either play solo queue or play other games they are interested in. 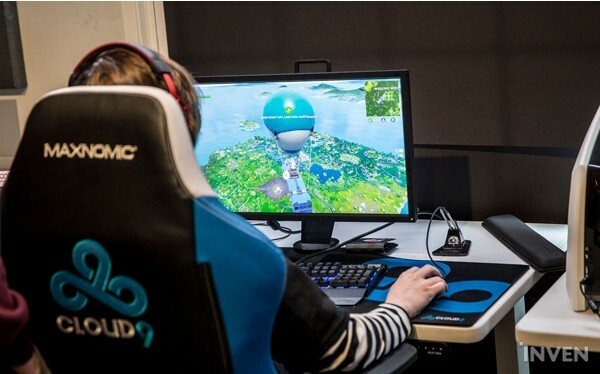 Cloud9 has a tight schedule of practicing from Tuesday to Sunday, 10:00 AM to 7:00 PM. When the season starts, the schedule for Saturday and Sunday will then change to NA LCS games only. It was also informed that other Pro Game Organizations have a similar schedule to that of C9’s. In order to reserve and book scrims with other teams, the other Organizations need to be in sync with one another. This takes place not only in North America but also in other regions that wish on scheduled scrims. Cloud9 has a set bedtime of 2:00 AM. 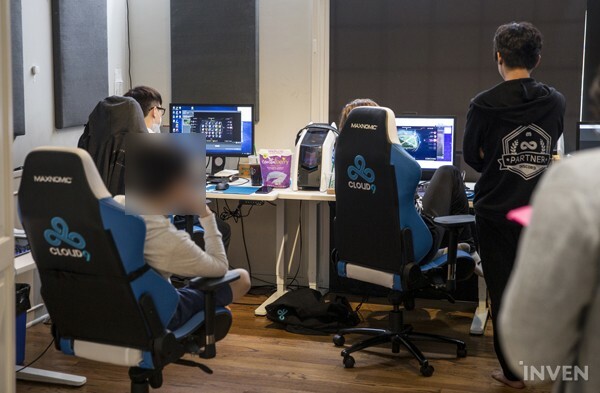 At 2:00 AM to insure the players sleep, C9 turns off all the WIFI and internet in the house. Until the start of the season, these players have to go through this every day from Tuesday to Sunday, 10:00 AM to 7:00 PM. This schedule and process is all a stepping stone. Building off one day of hard work after the other. If he even has one?